Like most biopics, aims to tell too much story, the price of which is superficiality of treatment. Despite a lot of dumbing down, the filmmakers still try to introduce a bit of complexity, but seem unsure of their view of the figure they are portraying. Crane shots indicate a wish for grandeur, but this director seemingly cannot avoid clunkiness. For my money, a more focused, thoughtful and intimate film on Little's prison transformation could be very interesting, but who's capable of making it? The vibrant colors of Do the Right Thing, the melancholy coolness of Mo' Better Blues, even the intimate closeup shots of She's Gotta Have It all come together for what can only be called Spike Lee's opus. The intricately woven match cuts in the montages are some of the most powerful I've ever seen. Denzel Washington's finest performance to date Powerful, Moving, Epic Film ! 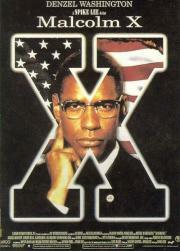 Excellent and mostly fair portrayal of Malcom X. But its critical flaw is it failed to deliver the punch line. He criticized blacks for being chumps for supporting the Democrat Party, and giving them 80% of their votes with nothing to show for it. He was killed 2 days later. The Nation of Islam was blamed, and they probably did carry it out, but who saw him as the greatest threat? None of that was covered. A sprawling epic that Spike Lee directs perfectly. His shot construction is great. Some of his best work (DTRT might be slightly better). The staging of the scene where Malcolm is shot seems so loose but is just expertly crafted. And of course you have to say something about Denzel here. One of the greatest performances I've ever seen.